Finally, my reflections in The Nation on what COP21 showed me about this world. We celebrated it because it’s the best thing that the status quo has done for this world. 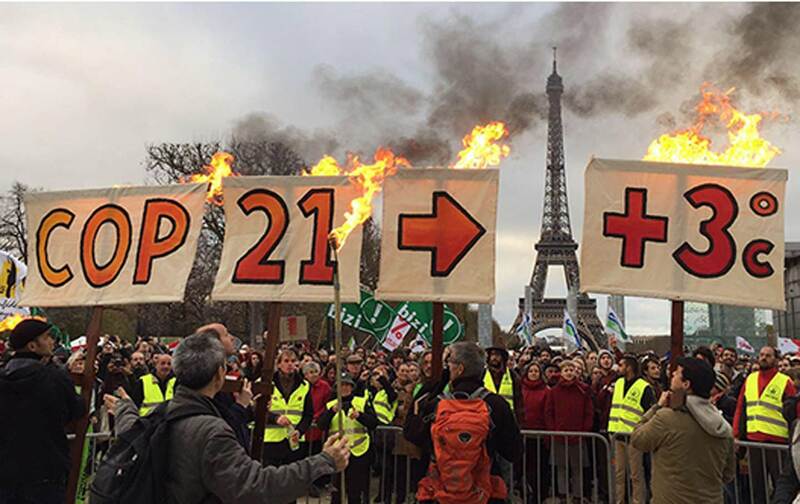 But COP21 demonstrates that even the best of what humans have learned to do is not enough. We can no longer be human-as-usual in the age of climate catastrophe. When I was younger, I used to be zealous about changing light bulbs. Then my focus shifted to changing the systems that determine how we use energy, because, as the saying goes, “we need system change, not climate change.” As a youth delegate to COP21—the international climate-change conference in Paris last December—I witnessed the most sophisticated political skills the world has to offer focus on one goal: to change the fundamental components of our energy systems. They failed. In Paris, I learned that there is an even deeper level of change required to prevent climate catastrophe. It’s not system change—it’s human change. COP21 was a big deal before it began. Unprecedented international commitment to address climate change set the stage for a global binding treaty. More than 150 nations submitted emissions reduction goals, compared to the 27 countries that made commitments ahead of Copenhagen’s COP15 in 2009. President Obama said that COP21 was the “best chance we have to save the one planet we have.” The grassroots movement fully engaged as thousands of people marched around the world to demand climate action. No doubt: Paris was an historic moment. By December 12, 2015, over 190 nations arrived at consensus, producing a 31-page agreement. For the first time, an explicit global commitment existed to end our dependence on fossil fuels. There was instant praise. A headline from The Guardian read: “nearly 200 nations sign in end of fossil fuel era.” John Kerry called it a “victory for all the planet and future generations.” Christiana Figueres, the highest-ranking UN climate-change official, tweeted:“We have made history together! #ParisAgreement at #COP21 unites the world for a better future.”COP21 was not the silver bullet to stop all climate chaos, but it was recognized as a huge victory for international collaboration. Celebrations erupted across Paris. I was surrounded by exuberance but had never felt more alone, grieving instead of joyful. Yes, COP21 was a political triumph, but I could not overlook a mountain of bare facts. The agreement is weak and profoundly unjust, condemning youth and front-line communities to bear the full brunt of climate catastrophe. There is no clear date by which the world phases out fossil-fuel use. There is an appalling lack of financial support for front-line communities facing the worst climate impacts. Even if all countries adhere to their non-binding emissions-reduction targets, our planet will warm 2.7C–3.7C, a level far beyond what is safe. The hypocrisy of COP21 was overwhelming as—during the negotiations—President Obama signed a bill expediting permits for oil and gas pipelines. At 3 am on December 12, headlines declared that John Kerry threatened to walk out of negotiations if developed countries were required to provide financial assistance to developing countries. A debate over “shall” or “should” dominated the final hours of COP21. The night before negotiations ended, I stumbled out of a meeting at 1 am and found myself on a shuttered Parisian street lit only by a few dim lamps. The cold wind whipped my cheeks, but my chest burned red hot with rage at the politicking that was celebrated while my generation faced doom. The worst pain came from images of my home that flashed before my eyes. I’ve already seen so much change in my short lifetime: The animals on our farm shed their coats during winter warm spells, only to freeze when the cold returns. Spring comes early. Summers are hot and dry. My heart broke at the thought of all that I love most falling prey to the chaos of politics and climate change. Anguish filled my soul as I realized that the best politics that the world has to offer are not enough to avert disaster. Then a revelation stopped me in my tracks. The euphoria around COP21 was fully merited. The agreement represents the best of what humans have learned to do over centuries: to use the political arts of compromise and negotiation to overcome conflict and unite disparate groups. But here’s the thing: COP21 demonstrates that even the best of what humans have learned to do is not enough. The climate emergency demands something else, something that lies beyond the known threshold of human political arts, beyond the known functions of the human toolkit, beyond the best that we have already achieved. The idea that we can no longer operate according to “business-as-usual” or “politics-as-usual” is by now a cliche. What struck me that night and drives me now is a different idea: we can no longer afford to be human-as-usual. In the age of changing climate, human-as-usual is not enough. Under that murky, light-polluted Parisian sky, I suddenly felt a sense of renewed clarity. I realized that our political systems are built to master human-to-human confrontation. Major historical struggles have been “us versus them.” Compromise was essential for the development of society and civilization. But today, our foe is not each other. Our foe is physics, and the physical world does not negotiate. It does not train on the art of compromise. We enter an unprecedented era of “us versus it.” We need to find new ways of being in which we are all on the same side, supporting one another as we confront the limits of physics. The very facts of the climate crisis require us to depart from the familiar territory of human-as-usual. What does it mean to move beyond the human-as-usual? To be honest, I don’t know how it’s done, what it feels like, or if people are capable of achieving new ways of being human. But I do know that we have to try. Crisis has always been the crucible of creativity, and that’s exactly what we need now. As long as we celebrate the outcomes of traditional political behavior, even at its best, we are blinded to the breakthroughs that may occur when we refuse to be as we have been before. Most importantly: If we fail to reach for un-usual behaviors, we will find ourselves reproducing the very behaviors and systems that created the climate crisis in the first place. This assures a never-ending cycle of shortfall and destruction. The climate crisis calls upon humanity to unite in ways that are novel, transcendent, creative, and brave. Not-human-as-usual is the seed of a new forest in the making, one that is unlike any that this world has known. Excellent review of the event Chloe! I didn’t expect anything binding, is there any useful binding parts of it? Is everything non-binding? While we, the 99% are not foes of each other for our fundamental interests world wide, the 1% who rule the world ARE fundamentally in opposition and we must find away to remove them from power, for they ARE the obstacle. We have neo-feudalism with corporations playing the role of the long-ago landlords, barons, kings, etc. Once they are decisively removed, progress can be fast and enormous.